May 30, 2018 was a great day for the Southeast Spartans! 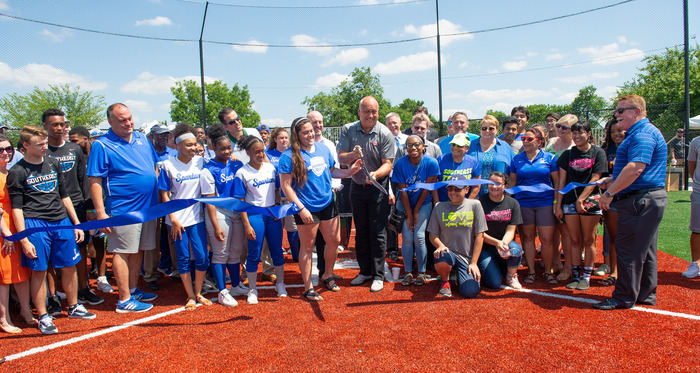 With help from Fields & Futures and the Cal Ripken, Sr. Foundation, Southeast High School is now the first OKCPS campus to have a synthetic turf baseball and softball field – representing the 8th complex and 21st and 22nd fields renovated by Fields & Futures. BIG THANKS to Cal Ripken, Jr. for joining in the celebration, and thanks to everyone who helped make the new fields happen! Special thanks to Blue Cross Blue Shield Oklahoma, Metro Technology Centers and OKC Energy FC for sponsoring this fun celebration! And thank you Niagara Water for the bottled water! It was HOT!! The next time you’re anywhere near Southeast HS (5401 S. Shields Blvd), we hope you’ll stop by and see these beautiful fields up close and personal!